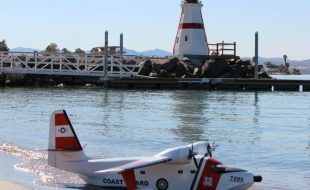 One of the important tasks you need to do correctly while building a giant scale airplane is to produce a smooth and flowing outer surface to apply your finish and paint too. 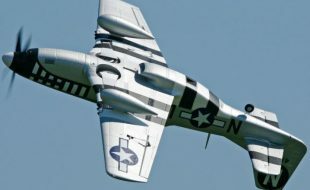 There’s an old saying that a fair paint job applied to a superior surface will look much better than a great paint job applied to an inferior surface. 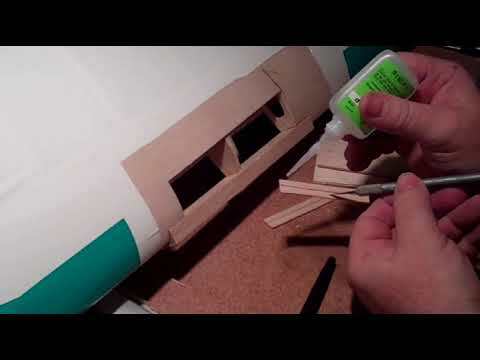 So, with that said, here’s how I apply balsa sheeting to a built-up fuselage. 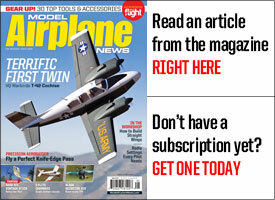 First, you have to build your airframe straight and true . 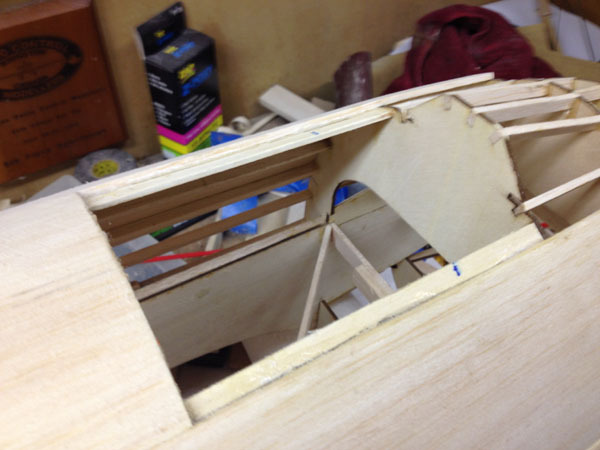 Take your time assembling the framework and install all the stringers and longerons so they fit flush in their slots. 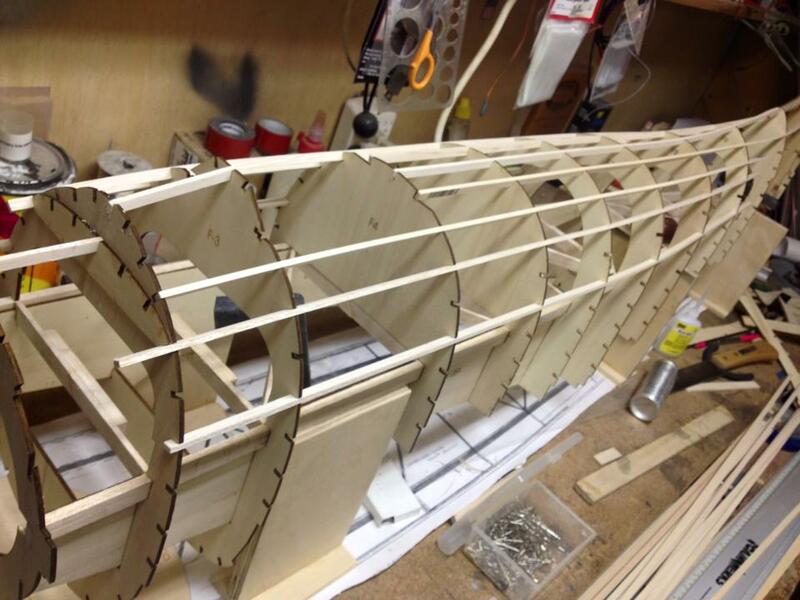 Work on both sides of the fuselage, adding one or two to the right side and then one or two to the left. This way you avoid building in stresses that can force the structure out of true. Then give them a light sanding with a sanding bar so you eliminate any glue globs or high points. 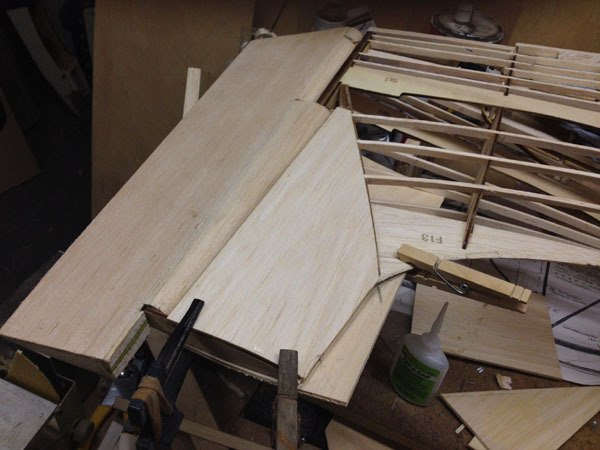 I also find it easier to install all the servos and the control linkages and pushrods before completing the fuselage sheeting. This way you can reach between formers and stringers and get to the hardware and install reinforcements in the proper areas. 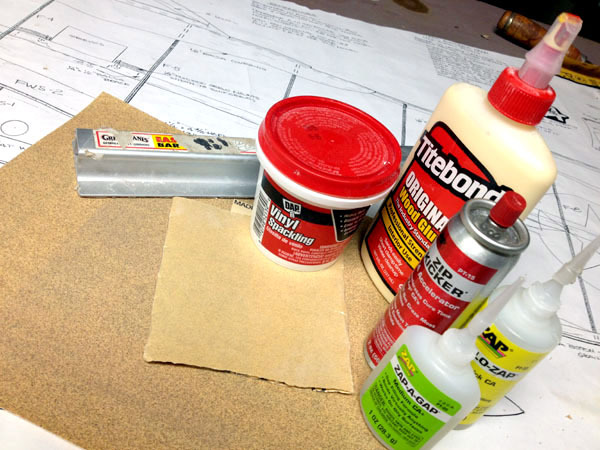 I find that the Titebond II wood glue sands easily and dries quickly and I use it for most of my sheeting. I also use thick and medium Zap glue and Zip Kicker for fast application of sheeting in some of the tighter and smaller areas. Also it is great for filling gaps under the sheeting. For sandpaper, I use cheap hardware store grade in 150, 220 and 320 grits. 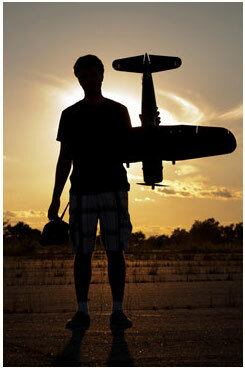 Also, I find Great Planes sanding bars very useful I have both 1 foot and 2 foot lengths and use 150 and 220 grits. For filler, I use Dap Vinyl Spackling often referred to as Sheetrock mud. I prefer to start at the front around the cockpit area. Measure the distance between formers so the sheeting pieces can he glued in place supported at their ends by the formers. After they are cut to length, use a mixture of water and ammonia, (I use a pump bottle of Windex), and spritz the outside of the sheeting lightly. Use some masking tape to hold the sheeting tightly in place until it is dry. 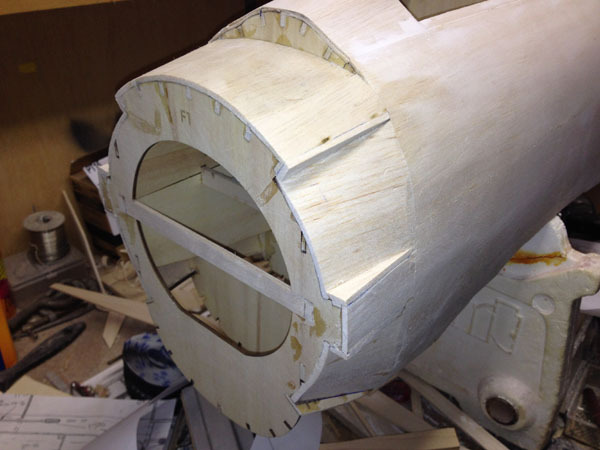 This will form the wood to the compound-curved shape of the structure. Apply some Titebond glue to the underlying structure then tape and pin the sheeting in place. The glue will dry in a couple of hours. Once the first piece is done, add the next piece of sheeting, applying glue to the matching edges. Make sure to form a tight seam between the sections of sheeting. If you have to, trim the edges so they fit nicely together, then pin the new sheeting into place. 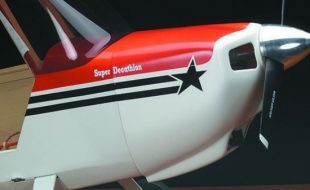 On either side of the cockpit opening, I install lite-ply doublers to support the sheeting edges. These need to be flush with the formers the sheeting is glued to. Work slowly and sand glue joints smooth and flush. 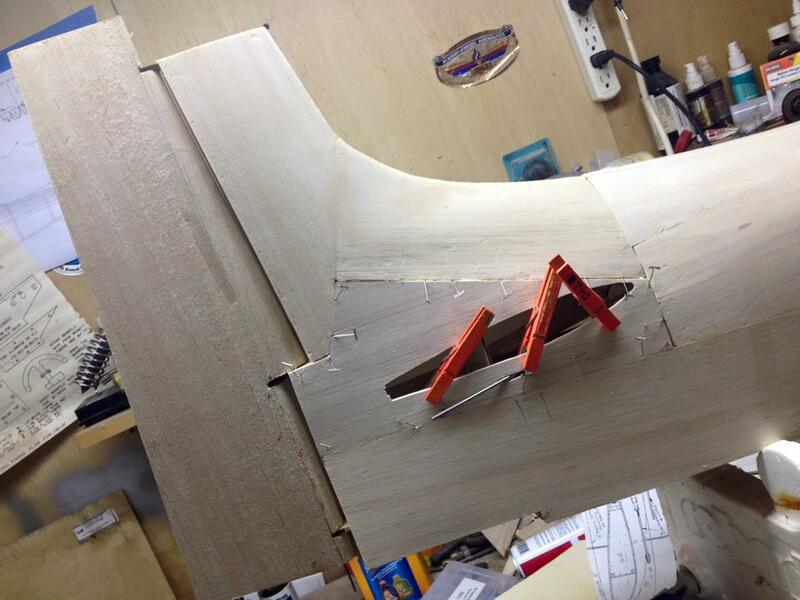 Here the next piece of sheeting has been glued into place (see above). Again it is cut to shape and glued to the formers at either end. 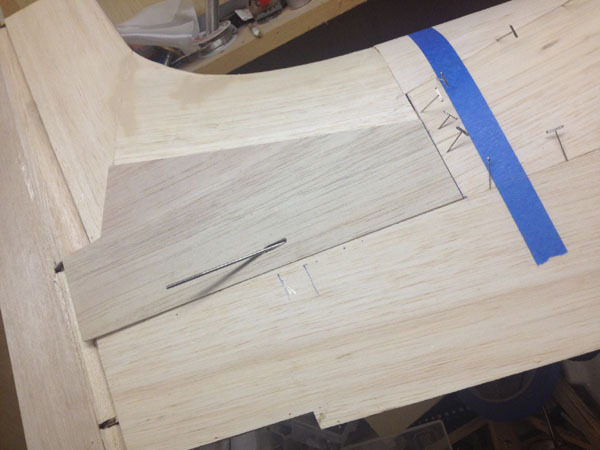 The grain runs parallel to the F-13 keel piece. 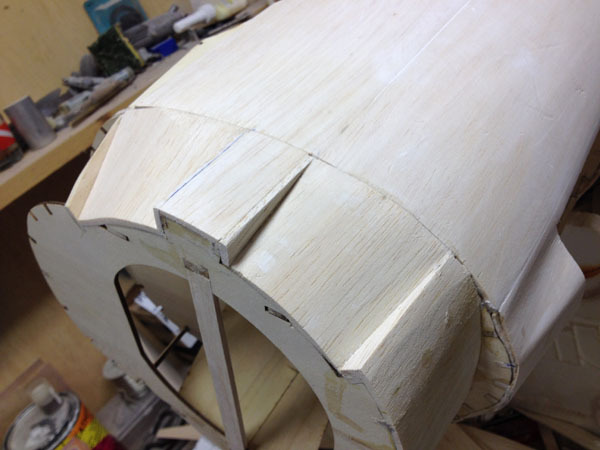 The next section is the most severely curved part of the sheeting. 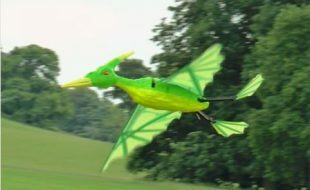 To do this section, I used two layers of 1/16-inch balsa sheeting. The first layer is applied in two sections (left and right), with the seam running along the top stringer. The second layer however is applied in three wedged shaped pieces. 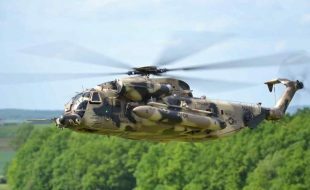 The center piece has its pointed end at the rear and its wide end butting against the top forward sheeting. This eliminates extremely sharp bends in the sheeting. 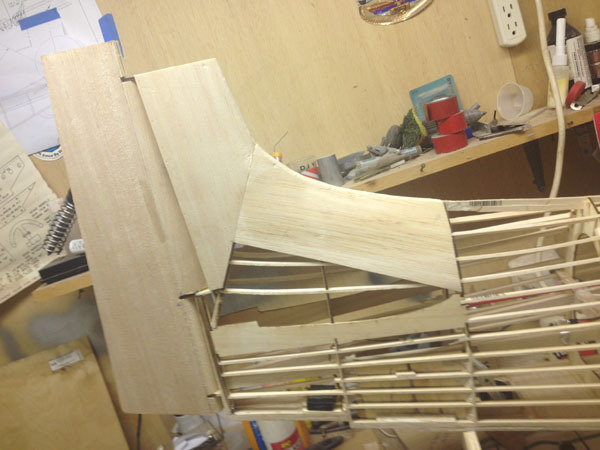 The two side pieces are then glued in place as shown completing the overall section. 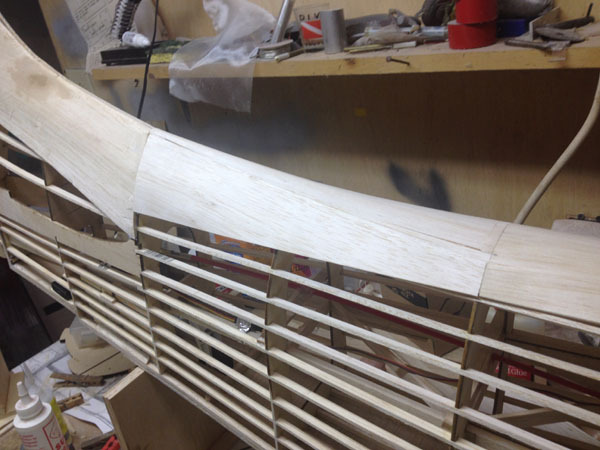 As the tail section sheeting is drying, go back to the front of the fuselage and continue sheeting the sides. Start at the second former as the sheeting forward of the former tapers and is applied with separate pieces. Again use pins, tape and clothes pins to hold the sheeting in place as the Titebond dries. Continue adding the various pieces of sheeting and use tape, clothes pins and pins to hold the pieces in place until the glue has dried. Notice that my T-pins are angled to hold the edges of the sheeting together at about the same level. While doing this, the edges sometimes float up or down and so I try to keep them relatively flush with each other to minimize sanding after the glue dries. Here’s the last section of sheeting which I fitted into place. 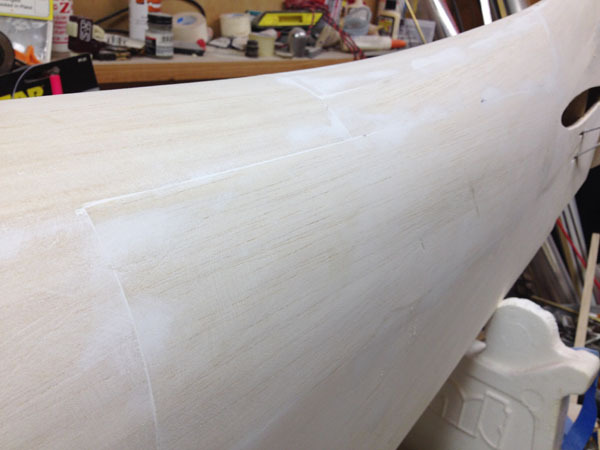 Work carefully and keep all the seams straight and tight, but do not glue it in place yet. 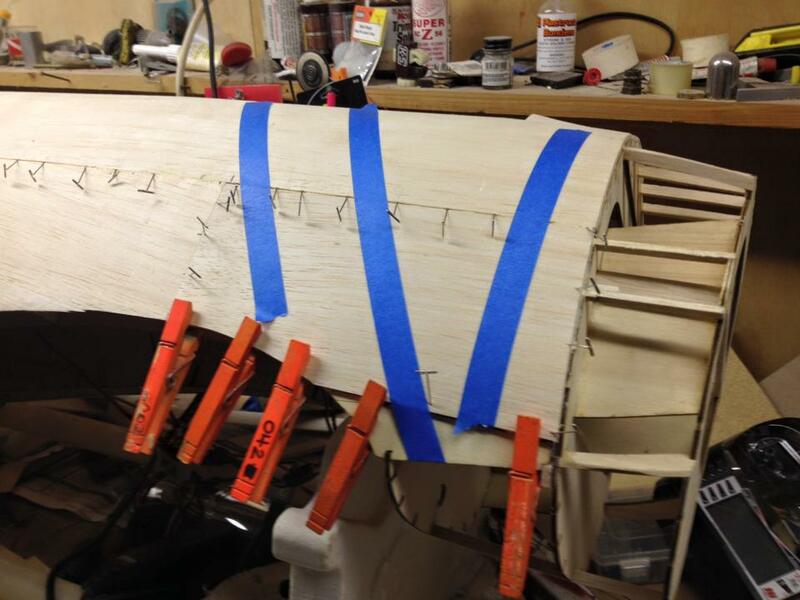 Using the plans as a guide, I then cut open the horizontal stabilizer saddle area as show above. 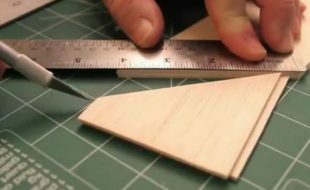 This is easily cut away using an X-Acto knife, starting in the center area and working your way outward. Be sure to take measurements from the plans to get the placement correct. The bottom half is definded by a light-ply doubler under the sheeting. Once I was happy with the shape of the opening and the fit of the sheeting piece, I applied some glue to the substructure and pinned the piece into place. I also used clothes pins to clamp the part to the lite-ply doubler. Here’s the sheeting part glued into place. It has been sanded flush with the rest of the sheeting. 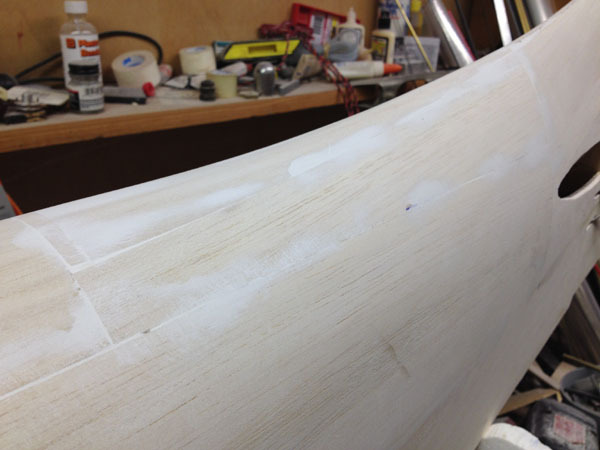 Before applying filler, I use a moist sponge to dampen the wood where I want to fill. I then use some scrap balsa sheeting to spread the DAP Vinyl spackling along all the seams between the sections of sheeting. 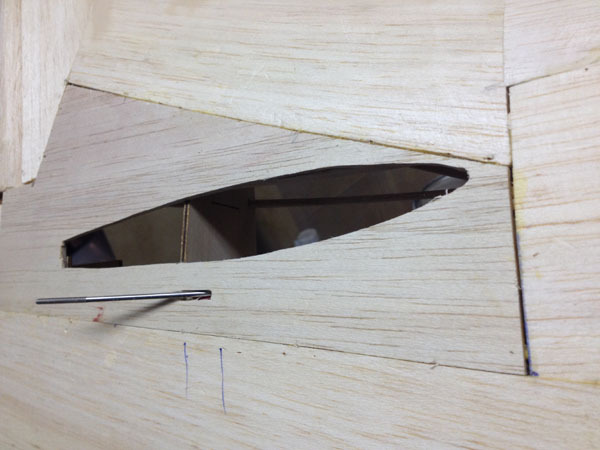 I like to apply it at an angle to the seam and press it down so it flows into the recesses. Once a section is filled and repeat going down the length of the seam, and then I scrap the access off to minimize sanding after it dries. The spackling takes about an hour or so to dry. Here you see the filler applied and drying. 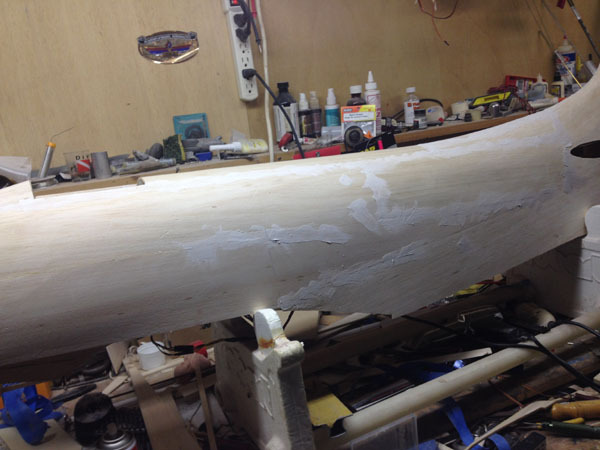 It looks like a mess at first but after it dries and you hit it with a sanding bar or sanding block, almost all of the filler material with sand away leaving only the sub-surface recesses filled. Once it all dries it’s time to sand. 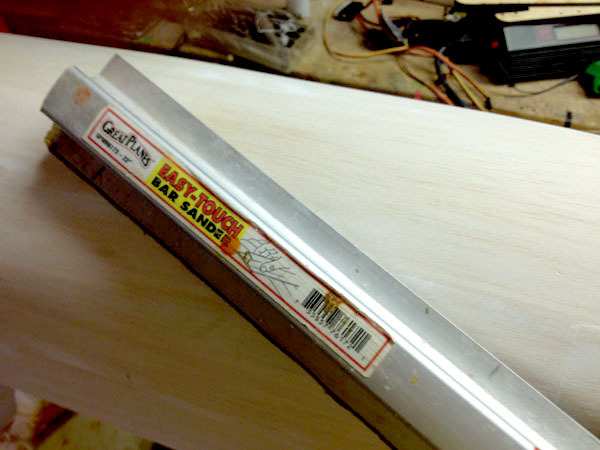 When using a sanding bar I sand it at an angle to the sheeting grain and edge directions. Being stiff and straight, the sanding bar knocks off the high points and produces a smooth wave-free surface. 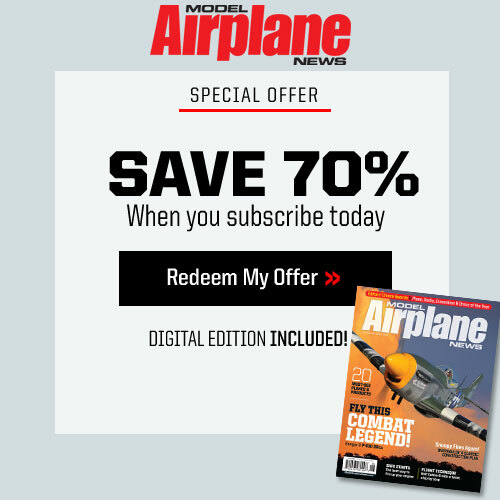 So before doing any filling of seams or dings, smooth all the surfaces with the sanding bar, then wipe the whole fuselage down to remove all the dust. 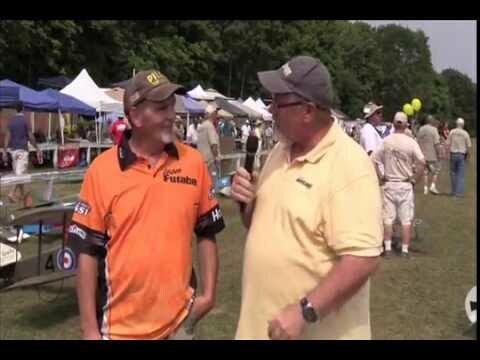 I use an automotive tack cloth. Here you see the first application of filler sanded smooth. It usually takes two or three applications to get everything nice and smooth. 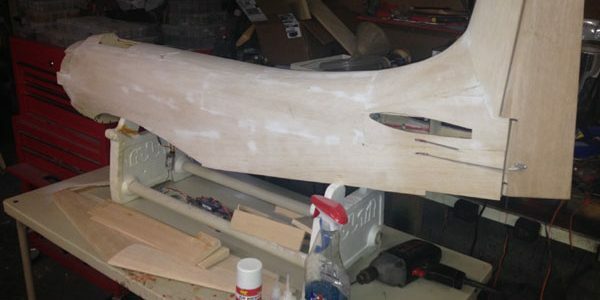 Once the fuselage has been sanded with the 150 grit, switch to the 220 grit paper and now, you can use sheets of sandpaper folded into thirds and sand the surface by hand. 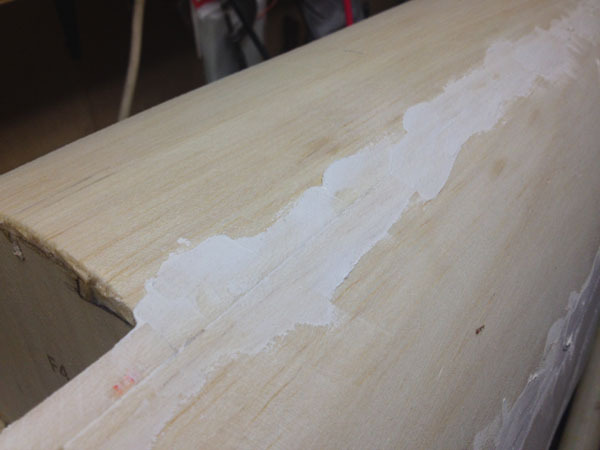 You will be able to feel if there is a sharp seam or bump which you can address again with the sanding bar. Here is the nose of the fuselage with the sheeting around former F-1. The firewall will eventually be glued against this former. Also note that the bottom chin section is left un-sheeted for now. This is so we can fit the wing into place and install the big alignment dowel through Former F-3 and into the leading edge of the wing. Apply more filler along any seams in this area, let dry and then use a long, narrow sanding block to dress out the corners. 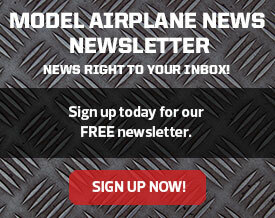 Don’t rush, take your time and apply as much filler as needed to end up with a blemish free fuselage. 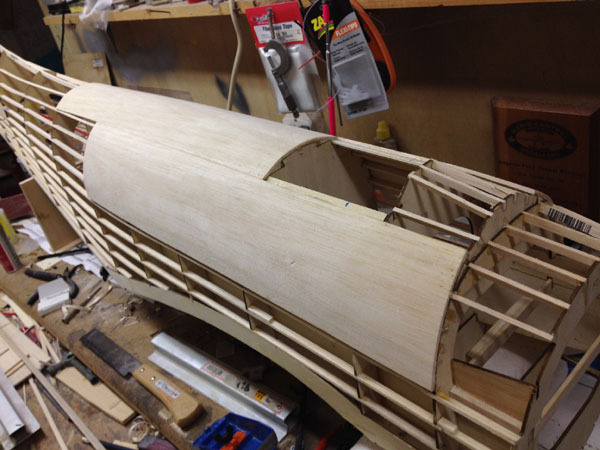 We’ll come back to the fuselage when we setup our engine installation and firewall details, but for now most of the sheeting is done. Once you happy with the smoothness of the sheeting, wipe it down and set aside so you don’t add more dents that will need filling. 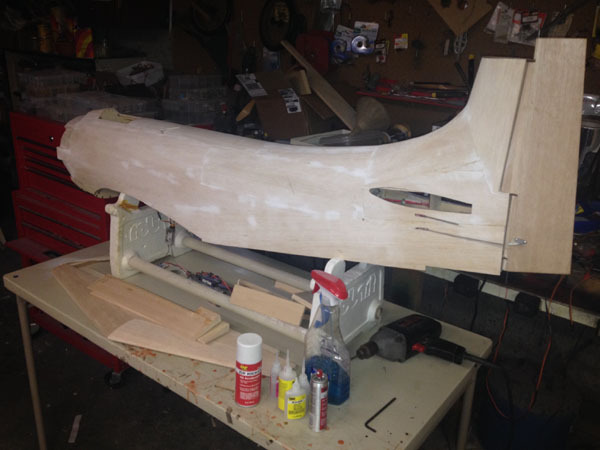 After the firewall is attached and the lower sheeting has been applied and sanded smooth, the fuselage will be ready for glassing using Z-Poxy Finishing Resin and .75 oz. fiberglass cloth. 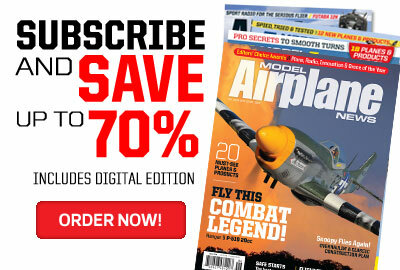 Also, be sure to use maintenance stand to keep the fuselage up and off of the workbench. Very nice. Look forward to future posts.